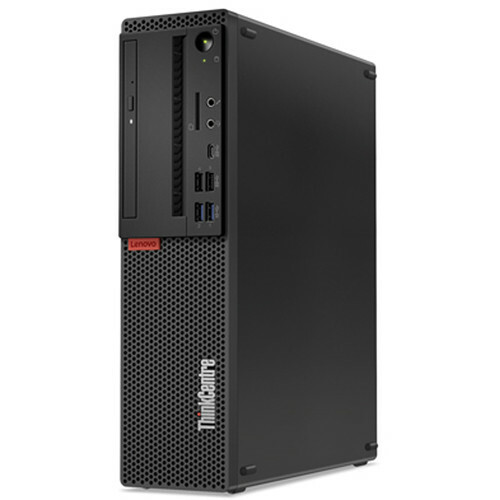 The ThinkCentre M720 SFF Tower Desktop Computer from Lenovo is engineered to work with robust workloads while remaining energy efficient with its 210W power supply and 2.8 GHz Intel Core i5-8400 six-core processor. Coupling this system's multiple cores with its 8GB of DDR4 memory allows you to run various applications simultaneously, so you can get your work done as soon as possible. If you need more RAM for enhanced multitasking, the ThinkCentre M720 SFF's memory can be upgraded to a maximum of 64GB. For long-term storage of your files, a 1TB hard drive offers quick access to your data, and there is an empty 3.5" drive bay for additional internal storage. Lenovo has built the ThinkCentre M720 SFF with an integrated Intel UHD Graphics 630 chipset, which delivers a sharp and clear picture while allowing for multiple displays to be used via its VGA and DisplayPort outputs. If you'd like to add external storage drives, optical drives, printers, memory card readers, or other peripherals, the M720 SFF features four USB 2.0 ports, two USB 3.1 Gen 1 ports, and two USB 3.1 Gen 2 Type-A ports, as well as a single USB 3.1 Gen 1 Type-C port for all your connection needs. In terms of accessing networks or the internet, the ThinkCentre M720 SFF supports Gigabit Ethernet. For your productivity, Lenovo's ThinkCentre M720 SFF comes with an included USB keyboard and mouse. Furthermore, this desktop tower is also preloaded with a Windows 10 Pro operating system, which provides useful features like Cortana and Windows Continuum. In addition, your data is encrypted and secured via the M720 SFF's Trusted Platform Module. Doubling the speed of its predecessor, USB 3.1 Gen 2 features a maximum throughput of 10 Gb/s when used with compatible devices. The SuperMulti DVD Burner supports a wide variety of optical DVD and CD media, including DVD±RW. The two DisplayPort outputs support resolutions up to 4096 x 2304 @ 60 Hz, while the VGA port supports resolutions up to 2048 x 1536 @ 50 Hz. Up to three independent displays are supported. The system uses an integrated Gigabit Ethernet controller for internet access when connected to a router, modem, or network switch. The 210W power supply is 85% efficient, which has earned the ThinkCentre M720 SFF energy efficiency ratings from Energy Star and EPEAT. Box Dimensions (LxWxH) 21.0 x 15.0 x 8.0"